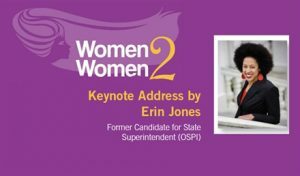 Education consultant, public speaker and former candidate for Washington State Superintendent, Erin Jones, will be the keynote speaker at “Women2Women,” Heritage University’s celebration of International Women’s Day on Saturday, March 17, 2018. Ms. Jones has been involved in and around schools for the past 26 years. She has taught in black, white and diverse communities. Jones has received many awards during her career, including “Most Innovate Foreign Language Teacher” in 2007; “Milken Educator of the Year” for Washington state in 2008; and in 2013, she was recognized as a “Champion of Change” at the White House. She’s worked for the Office of Superintendent of Public Instruction, and in 2016 she ran for State Superintendent, a race she lost by a mere 1%. At the time of her candidacy she was the first Black woman to run for any state office. “Women 2 Women” celebrates the women of the Yakima Valley and supports early childhood education. It is organized by Heritage University’s Women 2 Women collaborative and is sponsored by the university’s Center for a New Washington. Funds generated by the event go to child care scholarships for students whose children attend the Early Learning Center.